Warangal Jawahar Navodaya Entrance Test Results 2018,JNV Warangal 6th class Navodaya entrance exam results 2018, Warangal JNVST 2018 results, Navodaya Vidyalaya entrance results 2018 : The admission of student is only based on written test JNVST ( Jawahar Navodaya Vidyalaya Selection Test) and it will be conducted by CBSE (Central Board Of Secondary Education) only every year. 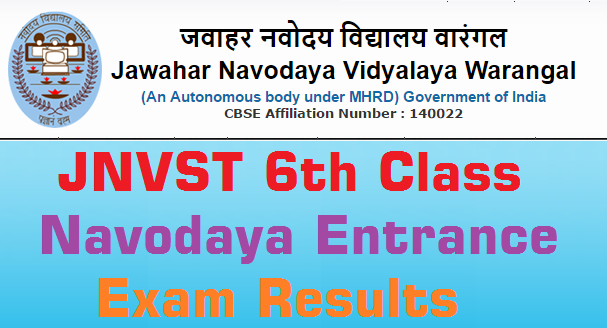 The Central Board of Secondary Education(CBSE) to be declared results of the Navodaya Entrance Test 2018 for admission to class VI of Jawahar Navodaya Vidyalaya at Mamnoor in the district. In a press note incharge principal, said that the CBSE conducted entrance examination on April 21 to till 80 seats in class VI for the academic year 2018-2019. Nearly, 12,000 aspirants took the test and 80 students were to be selected for admission, according to their performance in the entrance test, he said. Successful students will be informed through registered post soon, he said. The Results to be declared in " July 2018 last week" as per the schedule. Note: NVS Results ZIP File Extracted and Region wise, State wise, District wise results files links are placed on above link..